So, we’ve all thought the same thing: here you are scrolling through a Docbook XML book and looking for juicy tidbits to add to the index. Since there are no page breaks, you have to embed the index entries at each location in the source text. You’ve already figured out how to view the book in a more readable format, instead of the XML source code markup, in oXygen or XMLmind. Now, where was that? Oh, forget it. I’ll just have to edit the final output created when the index is generated. Ugh. Why can’t I just use my regular indexing software that I’m used to for this format? Well, you can, and you should. You know that it will provide a better index, less by-hand editing later, not to mention a whole bunch of peace of mind. Simply put, it allows you to index Docbook XML and HTMLBook the way you want to, using indexing software, like SKY Index Professional. The application prepares your XML files with viewable markers that you can use as “page numbers”. Of course, they have nothing to do with where pages will break, but allow you to specify where an entry should go, even if it is for a range of text. Once you complete your index, editing as you desire, you proceed to a couple of simple steps using XTUL once again to embed all of the entries at once. It only takes a couple of seconds. All index entry tags are generated in the XML source code markup as valid XML. There is no chance for you to make a mistake in adding index terms and no code to write manually! 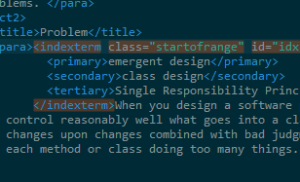 Does it automatically index XML Docbook? No, it simply enables you to add and edit all of your index entries at once and outside of any XML Editor like oXygen or XMLmind. Has it been tested in production? BIM has been using XTUL in-house for over two years on all XML Docbook and HTMLBook indexes. We even have a customized version that can enable us to index AsciiDoc in the same manner. BIM has found XTUL to be invaluable for creating all Docbook XML and HTMLBook indexes that are created. Even when chapters have to be done little by little or in batches, XTUL helps to work with the indexing of new chapters by allowing one to edit together with previous chapters, all for a much cleaner output. 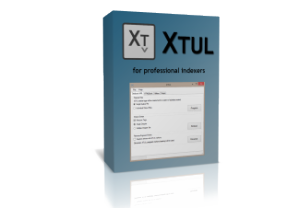 XTUL was created by Solid Knot and is available for download online.